Checking my voice mail tonight, I found that Thom Powell left a message on my phone. Apparently, his wife and neighbors notified him about a movie premiere tonight at a local movie theater. The project was entitled, "Evidence of the Sasquatch," and was produced by 1/4 Orange. Thom called to invite me to see the flick with him. I hadn't seen Thom in a month or two, so I readily obliged. However, the showtime was in only eight minutes, so I rushed to Hollywood (that's the name of a district in Portland, OR) and met him for the showing. Thom and I both pondered what the movie could possibly be about. We both figured that if neither of us had heard about it by now, it probably wasn't actually "evidence." Our best guess was that it was most likely a film school project by a local student. The film is probably best summarized as a Blaire-Witch -meets-bigfoot sort of thing: lots of shaky camera work combined with a rampaging bigfoot in Mt. Hood National Forest. I know that movie well... I have often lived it in my head on many dark, lonely nights alone in the woods. It wasn't anything I hadn't feared/fantasized about before, and in general was good, fun, entertaining stuff. Thom Powell posing with a movie poster. 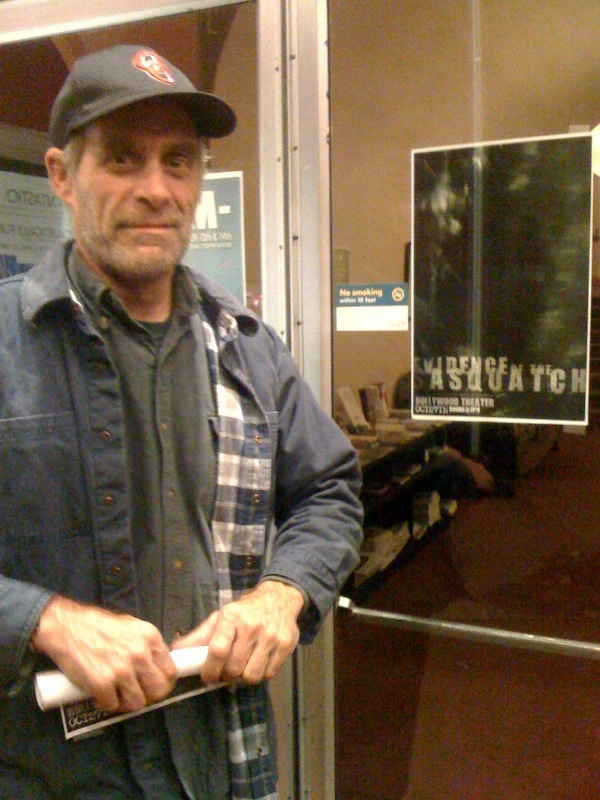 On the way out, Thom obtained a movie poster, and I briefly met one of the filmmakers and gave him my contact information saying, "If you want to know about the real thing, here's my card." The film showed a bigfoot that was "OK" on the reality scale. There were some things I liked about the depiction, and some that were the things that movies are made of... It had no hair on the face, but lots of hair everywhere else. It killed 3 or 4 folks during the 85 (or so) minutes of horror schlock. The wood knocks and the nighttime whoops/screams were pretty good. Heavy footfalls were featured several times throughout the film. Not bad, but very Hollywood (in more ways than one). Honestly, the whole thing made me really want to go to the woods. After the flick, I made a phone call to Guy Edwards of Bigfoot Lunch Club fame to fill him in on the movie. He invited Thom and I to a watering hole near his house for a beverage and some squatch-talking. Interesting tidbits regarding book releases, possible bigfoot footage, and other gossip was eagerly indulged in, and enjoyed by all. I love hanging with bigfooters talking about what's going on. There' always so much more than most people realize! After an enjoyable couple of hours pretending that I don't have to work tomorrow, I finally made my way home. Now, I better go to bed; I have to work in the morning. Welcome to a snapshot of my life. By the way, you do remember that Thom is speaking next week in Eugene, OR, right?